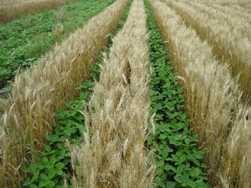 Spring planting is just around the corner and so is modified relay intercropping planting of soybeans into growing wheat. This is a very versatile system working across multiple row spacing’s and planting dates. Eighteen years of MRI soybean planting have been done in Bucyrus with wheat yields averaging 75 bushels per acre and soybean yields of 33 bushels per acre. Currently 24 field days on a variety of topics are being planned by Agriculture and Natural Resource staff starting June 1 through the fall with locations throughout the state. A complete calendar of dates can be found at https://agcrops.osu.edu/events. Full agendas are still being developed and you will want to check back for registration information along with other details about a month prior to the date. Modified relay intercropping of soybeans into wheat is a very versatile system across many row spacings. Over the past 17 years of intercropping at OSU Unger Farm, three rows spacings have been used. Ten inch spacing was used for the first 15 years, but this period also included three years of 15 inch work. The last two years, twin row wheat has been grown. The variations in row spacing show the flexibility of wheat to respond to various stresses. According to the Ohio Agronomy Guide, as wheat rows increase from 7 inches to 15 inches, yield declines on average by 4 bushels per acre. On August 26th from 10:00 to 11:45 there will be a field day at OSU Extension Unger Farm, 1303 Bucyrus-Nevada Road, Bucyrus, Ohio 44820. We will be reviewing the research that was done in Modified Relay intercropping last year. We will continue with a plot tour looking at our current research projects including seeding rate, and planting date trials. The field day will finish up by looking at our Intercropping equipment and a discussion on weed control.